What is the physical interpretation of this equation? Will both the currents exist simultaneously? Are any of the reverse currents getting amplified? 1/ ICBO is reverse leakage current going from the Collector to the Base. This current is then amplified by β to produce additional Collector current, thus the "1+β" term. 2/ Both currents exist simultaneously, but ICBO is included in ICEO. 3/ The reverse current ICBO is amplified, just like external Base current would be. 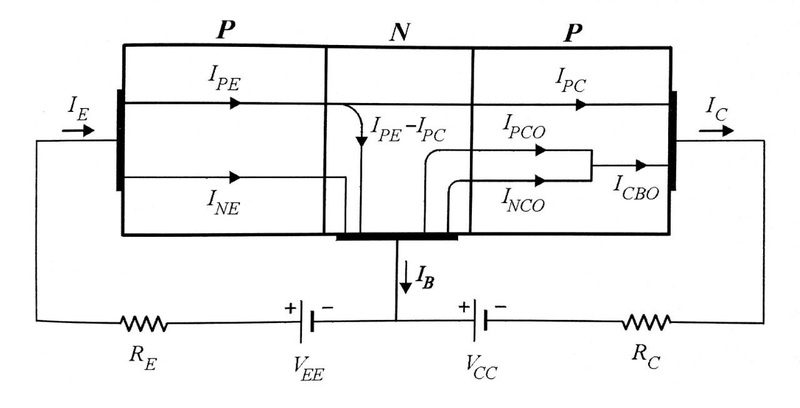 These are two different Leakage Currents for two different ways of Active Biasing of a BJT Transistor. I think the confusion with leakage currents, and other parameters, occurs because many textbooks don't explicitly state that the open terminal (b in the case of Iceo) and (e in the case of Iceo) is left 'open circuit' to allow the measurement of the parameter being measured. This is also true for h-parameters etc. where terminals are either shorted out or left open to effectively 'freeze' parameters in order to measure another parameter under known and benign (for the measurement) conditions. The equation relating the relationship between the parameters (Iceo and Icbo) apply when the device is in a correctly biased circuit. It is feasible for anyone to breadboard a transistor circuit and measure these parameters but one requires accurate meters capable of measuring very small currents. An easier way is to simulate the circuits using LTspice or similar free simulation software. Of course this last suggestion of simulation is simply to help the student understand how these parameters are measured and used. Not the answer you're looking for? Browse other questions tagged transistors diodes bjt photodiode phototransistor or ask your own question. Can reverse voltage gain for a BJT be negative?